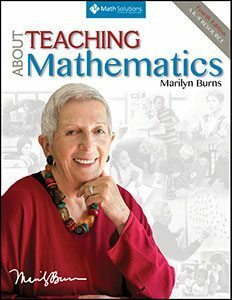 NEW from Math Solutions “About Teaching Mathematics: A K–8 Resource, Fourth Edition”, by Marilyn Burns, (2015). 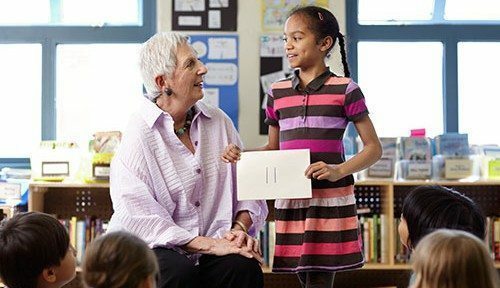 Many years ago, when I was beginning to lead professional learning sessions about math for K–8 teachers, I was asked to conduct six after-school sessions for the kindergarten teachers in the county where I live. I agreed, and seventeen teachers signed up for the series. Then I panicked. I had never taught kindergarten. What could I possibly have been thinking when I agreed? Yes, I knew what children were supposed to learn in kindergarten math and I had ideas about instruction that would support their learning, but my firsthand understanding of the demands of kindergarten teaching were limited to the few visits I had made to observe kindergarten classes. One of the teachers who had enrolled was a close friend. She had actually been the impetus for organizing this class, and I sought help from her. What resulted was the decision to hold the six sessions in six of the seventeen kindergarten teachers’ classrooms. I would plan the bulk of each session, and the hosting teacher would also contribute by talking about her classroom—why she arranged the classroom furniture as she did, how she organized children for math lessons, what she thought about when planning daily instruction, and what math content she was focusing on at the time we met. I sent out a note to each teacher who had enrolled and recruited volunteers. in those teeny kindergarten chairs for two hours after school well worth it. After this experience, I made the commitment to spend more time learning from teachers in their classrooms. I no longer was teaching full time and instead was devoting my time to writing and providing in-service. I keenly felt the need to be connected with actual classroom instruction. Since then, I’ve used a variety of ways to keep in touch. Some years I’ve “adopted” a class nearby, becoming a partner teacher for math time. Some years I’ve established a relationship with several teachers, at times supporting them by presenting lessons for them to observe, at times observing their lessons, and at other times “borrowing” their classes to try out new lessons I’m working on. This is a substantial list of characteristics, and the amount of time and effort needed to develop them depends on the students themselves and their previous learning experiences. What I’ve learned from my many classroom visits is that in order to help students develop these characteristics, it’s essential that they see them regularly modeled and encouraged by their teachers. Only then will students feel that their teacher values their thinking and that the classroom is a safe place for them to participate openly and fully. To encourage the attitudes of “let’s try” and “we can,” I’ve found it helpful to present problems or initiate investigations that have more than one particular correct answer or outcome. For example, many teachers use the number of the day for a warm-up routine. The investigation asks students to think of equations that use the number of the day, and the possibilities are endless. For younger children, using the day of the month for the number of the day relates the investigation to the calendar and limits the range of the numbers. Keeping track of which day of school it is, perhaps planning for a 100th day of school celebration, extends the numbers. Setting parameters structures the investigation further: “Use subtraction.” “Use at least two operations.” “Think of an equation that involves multiplication.” “Include fractions (or decimals).” “Make the number of the day the remainder of a division problem.” “Include at least one exponent.” Teachers use the investigation in different ways—having students work individually or in pairs, having students give equations orally and recording them on the board, or asking students to write three equations when math time begins and then having a few report what they wrote. It’s important for students to develop the mathematical practice of checking their answers to problems using different methods to decide if their answers make sense. To this end, it’s important to encourage students to find ways to verify solutions for themselves. Having students think about problems in more than one way, by talking with a partner or hearing others’ ideas in a classroom discussion, can provide alternate views on solutions. Not only is this good practice for classroom instruction, it’s also a helpful skill in most life situations. For many problems we face, there isn’t one correct solution but several possibilities. Often, an exact solution isn’t required and being close enough is sufficient. Most importantly, in real life, it’s often up to the problem solver to decide when a solution is right or best. (Life has no answer book!) In light of those issues, it’s important to urge students to evaluate their own solutions and to provide them support for doing so. Along with not providing answers, I’m diligent about encouraging students to explain their approaches and results, even when they are totally correct. 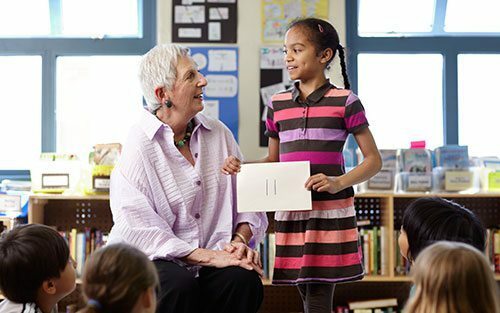 Often, teachers nod and affirm students’ correct responses and question them when there are errors. If we question students only when their responses are wrong, the students soon catch on. Instruction should be structured so students describe their methods and solutions not only to the teacher but to their classmates as well. Time for discussions is needed, and students should be encouraged to listen, question, and learn from one another’s ideas. It’s important to address the issue of making mistakes. Students need to see errors as opportunities for learning, not as unfortunate occurrences. They must feel that it’s OK to offer an idea that might be incorrect and know that they’ll have the support of their teacher and classmates to resolve errors in their thinking. I consistently emphasize, when asking students to think about an idea or solve a problem, that I value persistence, not speed, which relates to the mathematical practice of making sense of problems and persevering in solving them. Putting the value on quick, right responses does not help establish a classroom environment that supports students’ learning. One thing I’ve learned is that there isn’t one best way to manage math instruction. As teachers, we all have different teaching styles and ideas. I’ve also learned that thinking about how to help students become effective math learners calls for thinking about all that’s required to support and facilitate student learning—establishing a safe environment for learning, arranging the classroom furniture, defining how students are to participate in lessons, helping students establish productive learning habits, and managing materials for storage and use. Helping students become effective learners of mathematics requires consistent and ongoing reinforcement. With time, a classroom culture of curiosity, inquiry, and communication can become the norm.